Dave Acton has been interested in cars since he was a child, coyly admitting he used to run about school using his workbooks as a steering wheel! His first experience of car racing was at the age of 14, driving mini stocks at Crimond raceway. 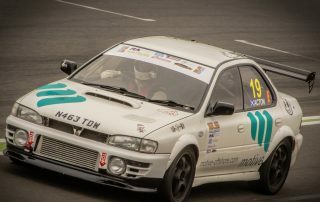 This enthusiasm has continued and in 2010, Dave bought a Subaru Impreza and used it for Trackdays, before purchasing another Subaru Impreza in 2012 and preparing it for track racing. With advancements to the car and driving time under his belt, Dave started competing in the 2015 SLS. The first round was on the 19th April – hence his driver number #19. Throughout the season, Dave progressively improved his times from 70secs to just under 60secs per lap by the season finale. With buoyant enthusiasm and a strong determination to get back on the track and improve his racing performance, Dave is now putting all his efforts into preparing for 2017 competitions. Work has already started on his car, with re-painting, engine rebuild and gearbox decisions ongoing. Dave intends to challenge in both the Scottish Motor Racing Club (SMRC) and Super Lap Scotland (SLS) competitions in 2017. There are many opportunities to support Dave’s efforts whilst gaining significant brand exposure and return on investment for your company, including exposure of your logo on the car and driver’s race wear to be featured across multimedia platforms in the UK and beyond. You can also benefit from a day out track side where you can build your business relationships by inviting your clients and prospects to join you. SCOTTISH MOTOR RACING CLUB (SMRC). SMRC enjoyed TV coverage of it’s seven Knockhill Race Club meetings in 2016, which is proposed to continue in 2017. All championship races are covered on Motors TV, offering the potential to reach 60 million homes across the UK and Europe*. The races are also featured on GoRacingTV.com, a free worldwide web video channel. Combined with extensive regional and national press coverage, including Autosport and Motoring News, excellent website and social media presence, as well as a newsletter issued six times per year, there are ample opportunities to get your brand seen by a wide and varied audience. SLS is sponsored by Rockstar Energy Drink, a world recognised brand. Each SLS event attracts an attendance of 1500 – 4000 people. All events have a 15 minute in-house highlights programme made for platforms including YouTube for the early rounds and the final round is filmed for a one hour bespoke programme aired on Motors TV. Significant media coverage comes via the Knockhill Racing website, which boasts 1 million unique visitors annually, alongside a Facebook page with 53,000 followers and a Twitter page with 13,000 followers. The SLS dedicated Facebook page adds an additional 4000 followers*. Driver profile listings on the SLS website allow for sponsors names and links to respective websites to be added. Interested to find out more about Dave’s championship challenge and how you can support his efforts? Please get in touch!